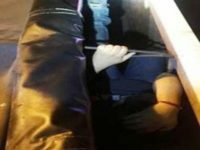 Laredo Sector Border Patrol agents arrested a female truck driver after they found 62 migrants locked in her refrigerated trailer. 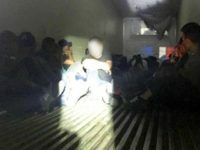 Border Patrol agents in South Texas arrested a human smuggler who allegedly had nearly 80 illegal aliens locked inside a refrigerated tractor-trailer. 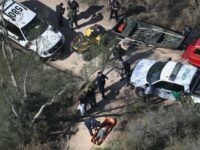 The driver initially fled from the Border Patrol immigration checkpoint in an attempt to avoid arrest. Laredo Sector Border Patrol agents disrupted a series of human smuggling operations in the past week. The incidents included smugglers using a tractor-trailer, furniture trucks, and a motel room as a makeshift stash house. Laredo Sector Border Patrol agents rescued more than 50 migrants from dangerous conditions in three separate incidents. Two involved packing migrants amidst cargo inside a tractor-trailer while the third involved 13 people stuffed in an SUV.